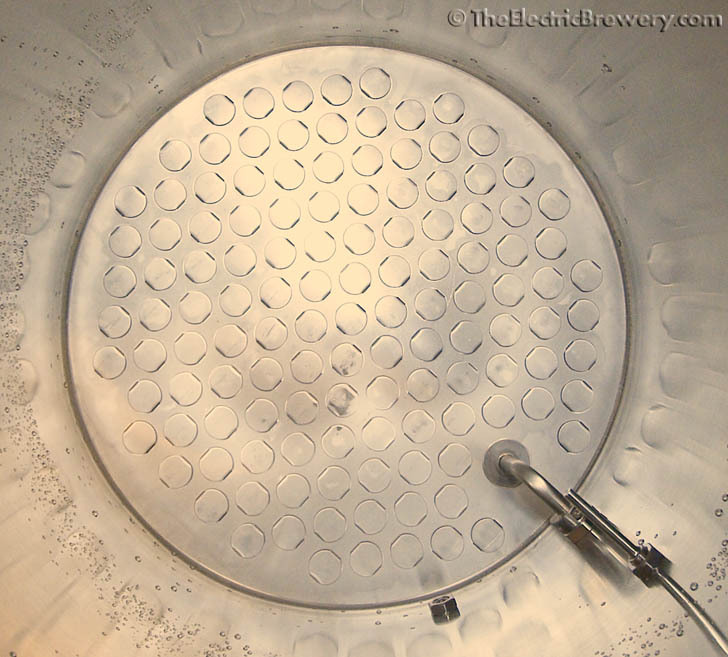 The one piece of optional equipment we purchased with the Blichmann BoilerMaker kettles was a false bottom used in the Mash/Lauter Tun (MLT) to filter liquid from the grain. The false bottom sits on a stepped edge at the bottom of the kettle and uses button louvering to allow liquid to pass through while keeping the grain back. Three small feet are installed underneath, around the center, to ensure that the weight of the grain does not warp or crush the false bottom. 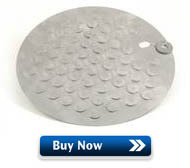 Blichmann marketing literature explains that the stepped edge that the false bottom rests on virtually eliminates 'sidewall shunting and channeling'. When the grain is rinsed of sugars in the Mash/Lauter Tun during the lautering phase, the liquid will always try to take the path of least resistance. Sidewall shunting happens when the liquid passes between the wall of the kettle and the mass of grain, reducing the amount of sugar removed from the grain. Since in our setup there is no easy path for the liquid to pass through at the kettle/false bottom junction, sidewall shunting is greatly reduced or basically eliminated. Channeling occurs when the sparge water used to rinse the grains does not pass through the grain bed evenly. In an ideal setup we want the sparge water to pass through evenly from top to bottom, rinsing the sugar off every last bit of grain. In some setups, the liquid will instead create 'channels' from the top of the grain bed to the bottom. This typically happens when the liquid must pass through a smaller area at the bottom of the kettle, as occurs when a mesh hose is used instead of a false bottom. The large perforated false bottom used in the Blichmann BoilerMaker kettles helps ensure that the sparge water passes evenly through the entire grain bed from top to bottom, essentially washing all the sugar out in a piston-like manner. For more information on how the Mash/Lauter Tun grain filter design affects efficiency, see Appendix F 'Lauter Tun Design for Continuous Sparging' in John Palmer's excellent book 'How to Brew' (pictured at right). John uses fluid dynamics and mathematical models to explain in detail why a design like the Blichmann false bottom is ideal. Less efficient setups will end up leaving behind a lot of the sugar that was released by the grain, which in turn results in a lower efficiency rating. Within reason, we don't feel that the efficiency rating of a setup is particularly important given that grain is cheap and homebrewers do not brew enormous quantities. A 10% difference in efficiency at homebrew scales will likely only amount to a few dollars more per batch. What is important however, is achieving a consistent efficiency from batch to batch. If the efficiency is never consistent you'll run into enormous difficulties brewing beer that is repeatable and consistent from batch to batch. In our Mash/Lauter Tun setup with the Blichmann false bottom not only do we achieve a high efficiency, but we also do it consistently. This means that we always know ahead of time exactly what to expect at the end of the brew day. We've brewed a range of beers from 3% Ordinary Bitters to 7% IPAs and in all cases the efficiency was the same which in turn means that our alcohol percentage and taste was also as expected. You'll also often hear the dreaded term 'stuck sparge' mentioned by brewers. A stuck sparge occurs if the draining or rinsing of the grain sugars becomes blocked or clogged for any reason. This usually occurs on setups when small or incorrectly designed mesh hose filters are used, and/or the grain is drained too fast. We've never experienced a stuck sparge on our setup, even after dozens of brews of varying size and complexity with fairly fast drain speeds. Unlike many third party false bottoms, the Blichmann unit does not require a wrench or any other tools in order to remove it for cleaning. As mentioned previously, the dip tube simply snaps into place in by hand. To remove the false bottom for cleaning, simply pull the dip tube towards the center of the kettle and rotate. The false bottom then lifts out easily. Stirring with our mash paddle is simplified as there are no protrusions such as handles or a dip tube that extends to the center of the kettle (as is done with many third party false bottoms). Solid stainless steel construction means that there is no chance of damage from the mash paddle when the brewer first mixes the grain and water (more information). Many third party false bottom solutions include a fragile silicone hose or stainless steel braided hose, both of which can easily be damaged if the brewer is not careful when stirring. There's an old saying amongst homebrewers that 'you should never let a stranger stir your mash' (due to the fragile unseen components hiding under the surface). This saying doesn't apply here. 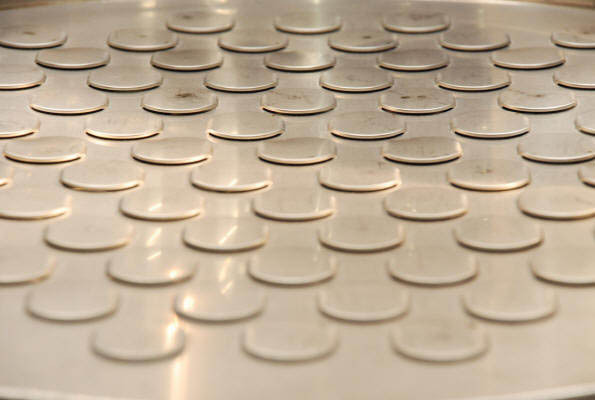 Long story short: We love our Blichmann false bottom! 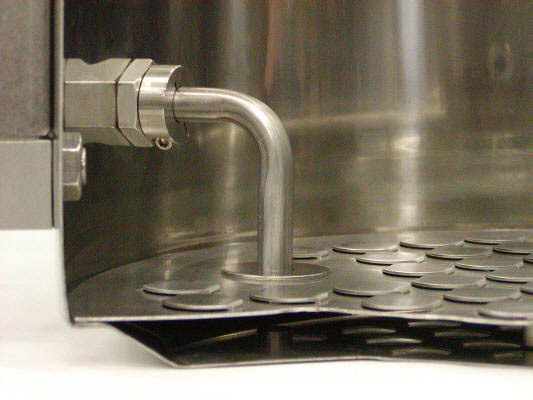 The dip tube extends through the false bottom to pick up the liquid that is allowed to pass through.